Lady Ashtar comes to assist you to open your heart and to see the greater truth, the bigger picture. She calls to you to let go any small-minded viewpoints and to see that the Universe is much larger and filled with the creation energy of God in all things. 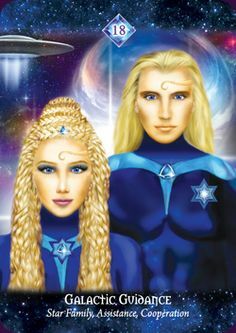 The Ashtar command is a group of light beings that work with the Galactic Federation to bring peace and anchor the Divine Plan n the Universe. It is said they are led by Lord and Lady Ashtar. Their mission is to serve as Ambassadors of love and light and to share the Universal Truths to support all living things. They offer support, assistance and love to all beings on the Earth. In the depths of Mother Earth’s heart Lady Lilith sits in support of the heart of humanity. She honors all living beings on the Earth and comes to assist humanity to understand this is the Oneness of all that is spoken. She says that until all sentient beings are honoured on Earth as one with humanity then humanity cannot come into Oneness because it holds separation in its heart. Lady Lillith comes to assist and teach all those to walk the path of unity in the heart of all and to let go separation consciousness with all of God’s creatures on the Earth. Lady Lillith is the ancient mother that holds all the light of God that is manifested on Earth and she steps forward to ensure that through the Earth realms all is honoured, all is held and all is loved. She will teach you that there is no separation with any manifestation of God’s love on the Earth. She asks you to not let your hearts and minds be distracted by stories and beliefs that create separation. She asks you to let go your superstitions, your stories, and your gossip and come into the Oneness of your heart. In biblical stories Lady Lilith was the first wife of Adam. God created Lilith from the earth like Adam and was therefore his equal. But she did not wish to stay in the garden so left the garden and went out into other lands where she met other men. In the bible they call her a demon because she did not do what she was supposed to do. The the bible story says God created another wife for Adam called Eve and this time he created her form Adam's rib so that she would be his servant and part of Adam and would not leave the garden. But this of course did not happen and Eve was blamed for the first sin of eating the apple from the tree of life, forcing Adam and Eve to be cast out of the garden. My understanding of Lilith is that she is a 5th to 7th dimensional being from this galaxy who joined with 12 other highly advanced beings from all over the Universe. They became the council of Universal Earth Mothers that created the 3 grid systems of light around the planet Earth before human souls came, they also assisted Mother Gaia and Earth Mother to prepare the Earth for the souls of humans to come to the planet so they could learn their mastery of physical matter. These Universal Mothers also created the 144 light portals on the Earth that support humanity to remain conscious and awake. Over millions of years many of these portals have become de-activated and have lost much of their power and so need regular activations from light workers on the planet, as well as Lilith and the Universal Mothers. "Dear hearts I bestow upon you the blessings of all that is and ask you to join me to sit within the one heart of all that is. To do this one must let go all that one holds in the mind and the being of eternal compromise that keeps you ever further from the heart of God. Do this and take my hand and we will sit together in light and love." Mary served in the Temple of Truth in the early days of Atlantis and tended the emerald fires of the fifth ray. It was here she studied the healing art and disciplines of the soul who desires to magnify the consciousness of God. It was here she worked with religion and science as the pillars of Alpha and Omega, working with the laws of flow that govern the science of precipitation. In all her incarnations Lady Mary worked closely with her twin flame Archangel Raphael. He is spirit and she on the earth (plane of matter) and together they proved that as above so below. In her final embodiment Mary was chosen to be the wife if Joseph (Saint Germain) and mother to eight sons, including Jesus, the first of her sons who magnified the light of the seven rays of the Christ. Also known as Mother Mary, it is said she volunteered before her birth to be the human mother for the incarnation of Jeshua onto the Earth. She is also called "Mother of the World” because in her service to humanity she is always ready to support and hold all those seeking assistance. She is the holder of the blue cape of compassion and unconditional love and is also the protector of children – all of God’s children. It is said one of her past incarnations on the Earth was as the Goddess Isis, when she instructed initiates in the Mystery Schools. She offers to humanity all the energy of the mother for her family – infinite patience, support, love, and assistance. She may also be called upon during pregnancy and the birthing process of children, but also of yourself, gifts, codes and other projects in service to the family of humanity. She will hold you in times of change and transformation in your life so that you may feel safe and protected. Call to Mother Mary when you wish to feel safe and supported, when you are birthing something new, pregnant with a child, to assist you inner child to know love, when your aspects need to be loved and held, when you need to be patient and surrender to Divine timing, when you need the Divine Mother energy in your life. Ask for her blue cloak to wrap around you. "I am the Divine Union of light and love and bring to you the holy chalice of perfection in oneness. Call to me when things in your life are out of balance and need restoration and unification. Call to me when joy and wonder are only memories and need the rekindling of the faithful flame of Divine Love and Light. I am the oneness upon which you seek." Lady Nada is said to be the twin flame of Jesus. She creates the balance of male and female energies. The flame of Love. Lady Nada oversees the temple above Lake Titicaca, Peru. Lady Nada once served as a priestess in the Temple of Love in Atlantis and attended the flame of Divine Love. Lady Nada is a Pleidian light emissary that has worked with humanity since the beginning of time in this realm. She has incarnated into physical body several times to understand the experience of humanity and the soul in this realm in order to better serve us. Lady Nada is director of the Karmic Board and works with the powerful voidal (liquid light) energies of creation. The thousand petaled lotus on her forehead symbolizes enlightenment for the feminine and the masculine, mental body and the opening of the third eye to see all in its true light. 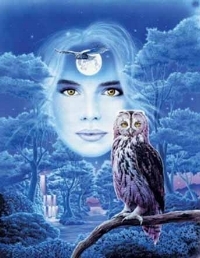 She teaches that intelligence requires the additional surrender to the Creator self within us to become wisdom. Lady Nada expresses the feminine initiations and is a temple keeper of the feminine heart for all of humanity. She assists the feminine to be empowered on the Earth, whether you are in the feminine body or whether it is your feminine heart flame. It is the vibration of love that is held through the voidal pathways of the heart of God that she opens within an initiate to connect with and in this place one finds the truth of your creation dreaming – all that you is called to create of themselves through the heart in love. She assists all to release the old karmic wounds held in the feminine heart through all generations to forgive and surrender all energy that keeps them from receiving love for themselves through compassion, forgiveness and love. She assists humanity to embrace its truth and to open to receive all that is possible for them – their unlimited potential I the heart of God - for this is the nature of their feminine vibration. As the old karma is assisted to be released, Lady Nada supports the feminine to return to its innocent heart and will hold the heart of the child within you to embrace this. Call to Lady Nada works to assist with mental healing, the upliftment of unresolved karma and choosing right action. Wherever there is pain and struggle and a feeling of disempowerment call to Lady Nada. Where there has been abuse of any kind call to Lady Nada. Where the innocent heart has been locked away call to Lady Nada. Call to Lady Nada where there is imbalance between the feminine and the masculine energy in your life. "I offer to all who call to me the Light and Truth of my being for I am one with the compassionate light of all that is. In times of turmoil and disharmony call my name out loud three times and I will come to you to ease your pain and suffering. I am the one." It is said Quan Yin is the incarnation of Mary, Sophia and other feminine icons, all being the same soul holding the feminine frequency. Quan Yin as a bodhisattva (a being of Bodhi, or enlightenment) has forgone the bliss of Nirvana through her vow to save all the children of God. She carries the Goddess and Divine Mother aspect of Buddhism as does the Lady Mary, Isis, Shakti, Parvarti, Radha and Sita. Quan Yin's name is a translation of the Sanskrit name of Avalokitesvara. In its proper form it is Kuanshis Yin, which means "she who harkens to the cries of the world". She is also one of the Lords of Karma on the Karmic Board and has the power to offer karmic absolution. Her proper name is Kuanshih Yin and means "She who harkens to the cries of the world". She is often portrayed pouring a stream of healing water blessing all with physical and spiritual peace. The dragon, a symbol of high spirituality, wisdom, strength, and transformation, is a common emblem associated with this goddess of Mercy. Quan Yin, the great goddess and Mother of Compassion, loved and revered throughout Asia and the world. Quan Yin is a beautiful expression of the Divine Mother and is often depicted riding on a dragon, holding all the elements of the dragon energy. When she ascended it is said Quan Yin turned back to save others and made this pledge - "Never will I seek, nor receive, private individual salvation, never will I enter into final peace alone, but forever and everywhere will I live and strive for the redemption of every creature throughout the world from the bonds of conditioned existence". Quan Yin teaches all the state of compassion and how to create this in your hearts through forgiveness and through acceptance of what is in each moment. She assists you to release your judgements and expectations so that you may truly holds compassions for all things – acceptance an embrace of all that is, not matter what it is. She offers you the upliftment to see all things as having reason and that it is vital for you to open your heart to all that is, even when you judge it and hold separation and resistance to it. She assists humanity to hold its heart open to all things. Quan Yin is also associated with the earth, fertility, and birth, and healing and brought forth the energies of Magnified Healing. She is the eastern counterpart of Mother Mary and she works to balance the feminine energy. Call to Quan Yin when your heart is closed and you are filled with judgement, separation, and resistance to anything in your life. Call to her when you need to forgive or need karmic absolution. 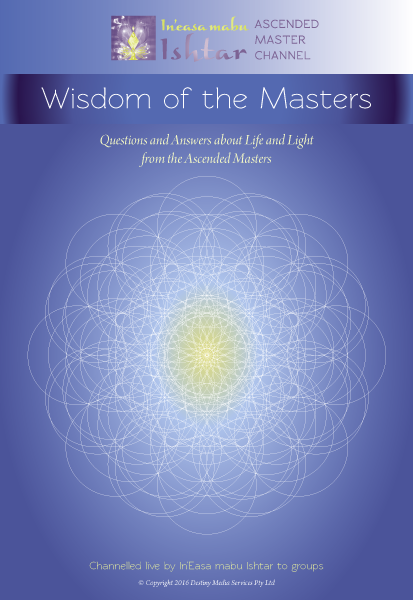 This Master offers healing and love. It is thought that Lady Sarah in one of her incarnations was the daughter of Mary Magdalene and Jeshua. This is why she is often referred to as the ‘Christ’ child. The mastery that she offers is the Divine made manifest on the Earth. She comes to teach you how to anchor the truth of our higher vibrations on the Earth and live and breathe this wisdom as our truth in order to build the new Earth in the Age of Aquarius. Sarah is a teacher and brings her light and love in sacred marriage as the twin flame within to create the Divine Absolute – the Threefold Flame of God consciousness in the heart of all beings. “The beauty and love that resides in the hearts of all souls is to be honored and celebrated in each moment. Seek not the dark or the shadow for you will find it in all light, dear hearts, but just like the light all will hold its gifts and these will be revealed as the light illuminates all that is. She is a Venusian being, who is specially engaged at maintaining energy exchange, transfers and communications between Venus and Earth. She is of a much higher development than that of a Master, but Sanat Kumara is Her Superior. She is often working together with other planetary beings and with some space fleet Commanders like Ashtar. Call on Venus Kumara when you need to find the beauty within you and to see the world in its beauty and see the abundance around you. She is also wonderful for when you need to be creative in life. Lady Portia assists your heart and mind to see its true beauty and to bring the masculine and feminine hearts of humanity into balance. She teaches humanity the importance of merging the twin heart flames of love (feminine) and light (masculine) to create divine union and thereby activating the threefold flame where all are merged with their God Presence. Portia is said to be the twin flame of Saint Germain, who after thousands of years of service to life on the seventh ray of freedom, justice and mercy, earned the title of Goddess of Justice and Goddess of Opportunity. Lady Portia also serves on the Karmic Board and offers dispensations of karmic absolution for all that is held in separation between the feminine and the masculine hearts. She holds the scales of justice, which were known to have been held in Ancient Egypt by the Goddess Ma'at. These symbolize the perfect balance of spiritual understanding of the Divine Mother, who gives the perfect balance of mercy and justice. Portia assists humanity through her wise counsel which asks souls to see the great opportunity they are given when they are incarnated into the Earthly human life. It is said Portia ascended before discord began to manifest on Earth, and remained in the Great Silence (Void) for a long time, holding the balance for her embodied twin flame. It is claimed that when Saint Germain, embodied as Francis Bacon and wrote The Merchant of Venice under his pen name Shakespeare, he inserted her name into the play. In 1939, Portia stepped out of the Void to assist the ascended Saint Germain to bring forth the I AM teachings to the world. Call on Lady Portia when you wish to see the beauty of all things and all experiences in your life. Call to her when you wish assistance between the masculine and feminine hearts in your life and in yourself. Call to her when you wish for karmic absolution. A powerful force in the early Christian movement, it is said that Mary Magdalene was the wife of Jeshua of Nazareth and the mother of his children, a daughter Sarah and son Elijah. She wrote her own Gospel, which is still not recognized by the Christian Church. Because she was a female she was reviled and slandered by the Catholic Church and called a harlot, in the same way that this Church has reviled all women since its inception. Only in the last five years has the Church admitted it was wrong about Mary Magdalene and agreed she was not a harlot. Ascended Master Mary Magdalene works with the energies of the Divine Feminine. It is said she has lived many lifetimes but the only one that is mentioned is that of Sarah, the wife of Abraham, who it is said was El Morya. Mary Magdalene has only recently taken on the mantle of the 12th ray in service to humanity, which was oversouled by Pallas Athenee. As we enter the new age, the Magdalene has taken on this mantle to assist humanity to align to their Christed nature and to make this manifest on the Earth. She has told me (Ishtar) that she is one of the original Earth Mothers that came to the Earth from the stars long before humanity arrived. These 12 Earth Mothers created all the crystalline gridlines and sacred portals of the Earth body in preparation for mankind. The Magdalene energy was first made manifest in ancient Atlantis in the body of a high priestess within the temple of the Divine Mother. The Magdalene Flame is the feminine heart flame that assists mankind to align to their creation potential through the heart of Source. It is fully aligned and merged with the Maitreya energy of God consciousness, thereby holding the divine presence of the Triple Flame of the heart of God. It aligns both man and womankind to the creation energy of Source. Mary Magdalene is an ancient spirit, an Ancient Earth Mother and also a high priestess in the times of Atlantis and in Egypt in the Temples of Isis. She was trained to carry and express the Light of the Magdalene Flame for possibly the last time for more than two thousand years on the Earth. It was her destiny she knew to join the Magdalene flame with its masculine counterpart, the Maitreya energy, which was contained within Jeshua of Nazareth. The kindling of these flames, the joining of these two in love, achieved the Divine Union of God consciousness incarnated and made manifest on the Earth. It is said that when the flame of the Maitreya and the Magdalene vibration were joined together at this time a powerful energy descended upon the Earth in preparation for what was to come. It silenced many of the old ancient powers and ushered the beginning of a change that would lead eventually to the ultimate transformation of the Earth. It was the harbinger of the Age of Pisces, a time of masculine dominance, after the age of the Goddess. The two thousand years of patriarchal dominance served a divine purpose to teach mankind of its potential as a Creator Self. In the new age of Aquarius it is time for the Divine Union that was anchored on the planet through the hearts of Mary Magdalene and Jeshua to be made manifest in the hearts of humanity. The Magdalene flame seeks to reawaken within the hearts of men and women. Now in this Aquarian Age it is time, not simply for the power of the Divine Mother energy to return to the physical realm but for her power to merge with the presence of the Maitreya, so together they may birth the Oneness in the hearts of humanity with the heart of Source. The Threefold Flame will merge as One in all hearts so that humanity may become God-realised on Earth. Call to Mary Magdalene when you face challenges and are in crisis. Call to her to assist you to open to your divine power and wish to embrace your God nature and merge fully with the your Divine Presence and walk this on the Earth in your Divine truth. Call on her when you are ready to manifest the divine mission of your soul and need strength and endurance. She hears all the calls of humanity. She comes to hold and nourish you, offering compassion. Divine Mother assists you to learn how to birth your own creative energies on the Earth. The Divine Mother is called by many names including Isis, Lakshi, Mother Mary, Quan Yin and others. They are all aspects of the Divine Mother God, who births the Creation consciousness, while Divine Father God manifests it into form. Divine Mother comes to assist unification. Wherever there is separation energy she calls it into Oneness. She will assist you in your life to release your separation to self and others so you may come into Oneness in your heart. Comes to honor the feminine in all beings and to remind us that we all hold — men and women — the feminine energy of God creation in our souls. She asks us to honor this energy because it is what assists us to connect more deeply with our higher consciousness and the heart of God within. It is the part of us that opens to receive and this is what Isis teaches us — to open to receive. Isis is a revered Goddess of Ancient Egypt and governed motherhood, magic and nature. She was also the protector of children and of souls who had passed over. She is well known for being the Goddess of rebirth. She is an intergalactic Universal being who is on the council that oversouls this galaxy and concerns herself with Sirius, Earth, Pleiades, Venus and Andromeda and Arcturus. She also holds the balance between the feminine and masculine hearts of God and assists all beings to come into the wisdom of opening to the twin flames of God’s heart within them so they may fully embrace the mystery of creation and flow within this consciousness in all that they create. Ishtar supports and assists all being to understand the fundamentals of Universal Law so they may accept that in everything they do this conscious permeates all. When they choose to open to the Universal Laws and accept them in their lives then they will find the grace and peace they seek. On the Earth Ishtar manifested into the physical form three times to assist the hu-man souls, firstly as one of the 13 Universal Earth Mothers that reconnects the light grids of connection on the Earth so all may remember that which they are. Secondly as the Akkadian goddess that was known as Ishtar who brought balance and plenty to many of the nomadic tribes in Persia and Mesopotamia, and then she assisted this consciousness to merge into the Isis cults of Egypt, Greece and Rome. She is known as the Master of Law and Justice and fertility and created the early rites of Tantra on the planet to assist hu-man souls to reach the nirvana that is only possible when they open to the twin flame consciousness. Ishtar is symbolisedby the symbol of the 8-sided star of Venus. She is the goddess of wealth and prosperity, both material and spiritual in India. Lakshmi is the household goddess of most Hindu families, and a favorite of women. Although she is worshiped daily, the festive month of October is Lakshmi's special month. Lakshmi Puja is celebrated on the full moon night of Kojagari Purnima. She is also connected to the ancient Persian goddess Ishtar and the Asian goddess Vasudhara. She is the wife and active energy of the Hindu god Vishnu. Lakshmi is depicted as a beautiful woman of golden complexion, with four hands, sitting or standing on a full-bloomed lotus and holding a lotus bud, which stands for beauty, purity and fertility. Her four hands represent the four ends of human life: dharma or righteousness, "kama" or desires, "artha" or wealth, and "moksha" or liberation from the cycle of birth and death. When Vishnu incarnated on the Earth as Rama and Krishna, it is said Lakshmi incarnated as his respective consorts: Sita (Rama's wife) and Rukmini (Krishna's wife). In the ancient scriptures of India, all women are declared to be embodiments of Lakshmi. We respect your privacy and will not pass on your details to any other party. What course have you done?